Collaborative print project created by Sarah Boris. Co-led by Nancy and Phillipe Vermes. In May 1968 students and workers from all over France came together at the Académie des Beaux Arts in Paris in an outcry to defend their rights for freedom and equality in education and employment due to social, economical and political unrest. Within a week the student strike grew to a demonstration gathering over one million people in the streets of Paris, culminating in the occupation of the whole University premises on 14 May 1968. In the next morning an assembly was constituted in which they set out democratically the foundations of their demands, which would also kettle the biggest social revolution in Europe. 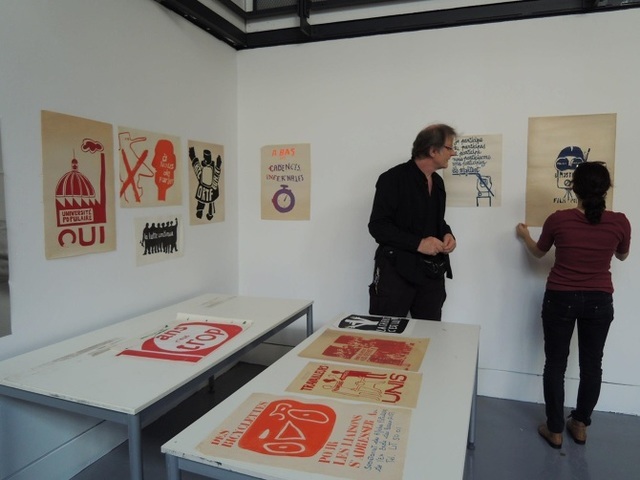 Students, artists and workers produced over 300 posters in the course of one month and a half. The posters were screen printed and the occupants of Beaux Arts premises relayed each other day and night. Global changes and new laws keep on shaping our society towards the deprivation of individual and collective rights leading us to the loss of what previous generations fought for in May 1968 (end of free education and health, loss of workers rights etc.). The idea of the 48 Hour Splash international Residency is to gather eight to ten artists from diverse backgrounds and artistic practices, in order to give voice to our concerns for current and future times. Our ambition is to explore ways to express our views and simultaneously create a visual output in the form of screen prints with the aim to develop a growing on-going artist network platform. The artists shortlisted have combined experience in painting, illustration, print making, poster making, poetry, writing, typography, design and ‘artivism’ (activism and art). The project is set over 48 hours to explore the collective capacity to create over various times of the day and the output possibilites which can arise from working in a short time frame which inevitably will influence the content and process. The project does not have the pretention to replicate May 68 in any way but is informed and inspired by the ethos, production and creative process, which took place then.